Everyone knows that my favorite food is pizza. Last night my mom and dad decided to have pizza for dinner. They ordered a pizza that I never heard of. They said that since Memphis is famous for Barbeque, they thought I could try a new kind of pizza, Barbeque pizza. I thought that sounded interesting. So they gave me a slice. Mmmmmmm. SO good. I 'm really liking Memphis! We met our neighbor dog yesterday, a black lab named Pearl. We saw her name on her collar. 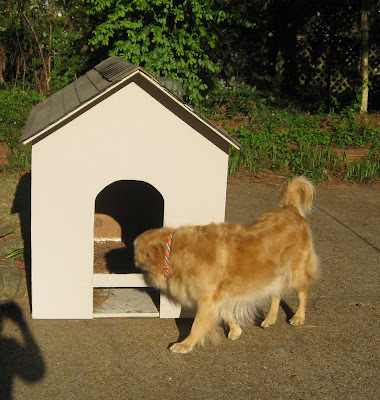 She was barking a lot especially since there were workman right near the lawn. I ran over to her by the fence and she growled,snarled and showed me her teeth. Pearly white. But whoa, I got the hint! But that didn't stop my mom of course. She walked right up to her and started talking really sweet to her. She even gave her one of my new tennis balls! Can you imagine? Pearl didn't seem to care about that. She was focused however on getting mine. But luckily that couldn't happen, she'd probably bite me with those white teeth. I guess Pearl has yet to be cultured. I have heard Mom and Dad talking more about a new brother or sister for me. So I got to thinking about having siblings at my new house. Right now, my pack is my Mom and Dad. But if I get new brothers and/or sisters, that means my pack will be bigger. So I think because of my seniority in the family, I should be the leader of the pack. My dad is never going to go for that. 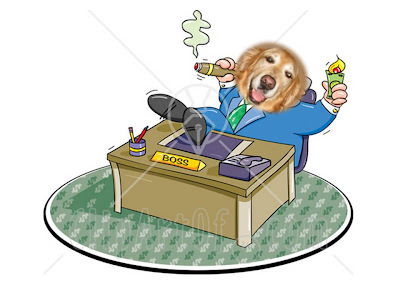 So I will be the Canine Boss. I need to get new cards printed: Bear, The Boss. I went to a fair last weekend in Shelby Farms Park and met these really nice people. They told me and my Mom & Dad about about the Off Leash Society. They have a 37 acres park within the park where it is leash free. Wow! We couldn't go that day, but we will soon. So my Mom & Dad donated by buying t-shirts and me a bandanna. And I signed up so I am now an official member of the Society. How impressive is that. Less than a month here in Memphis and I am already part of the Society. Need to get that tuxedo! My new favorite thing is grass...in my yard that is. I just cannot stop rolling in it! Even when my mom throws the ball to me, I get the ball, but I don't retrieve. I just start rolling. I don't know what has come over me. The grass in Memphis is so amazing. It smells and feels so incredibly good. I think now I know how cats feel about catnip. The Memphis grass is like dognip. Maybe I should market it. In my new yard there is this little house. I am not sure what it is for. There is nothing inside of it. At first I thought maybe it was for me. But I dont think so because I am always in the big house. I have heard humans use the expression that "he's gonna be in the doghouse" when someone does something bad. So I thought maybe this is where Daddy has to go when Mommy gets mad at him. Ya think? Mom has always been on Eastern or Pacific time, so prime time to her is from 8 - 11pm. Now that we are in the Central time zone, Mom keeps missing her 8:00 TV shows because they come on at 7:00. She catches her 9:00 shows because they are on when she thought her 8:00 shows were on. Sometimes she misses the 9:00 show if she didn't have an 8:00 show planned. 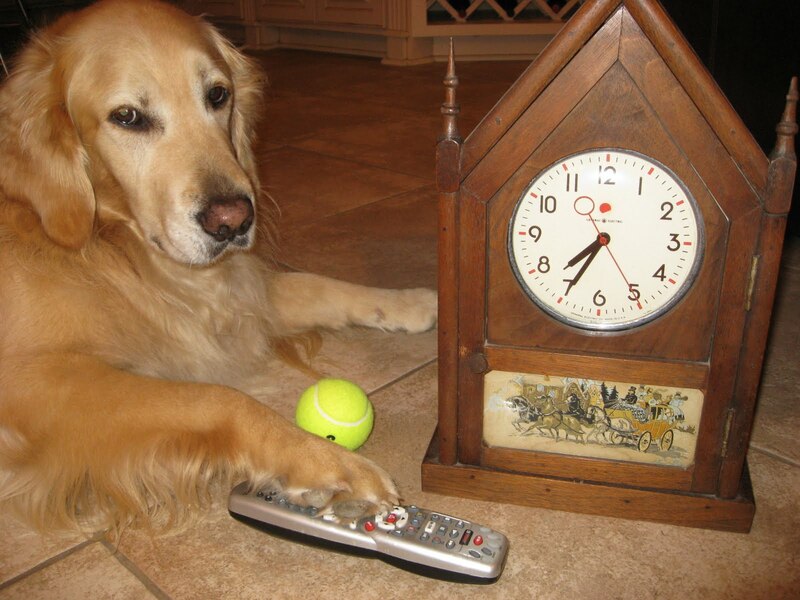 She pretty much always catches the 10:00 shows because she realizes it by 9:00. Wow. And of course, her sleeping patterns are all messed up which impacts mine. This all got me to thinking that something is needed to automatically switch one's body's time zone. I know! They need to invent the iZone. Today is the celebration of William Shakespeare's birthday. It got me to thinking. He was a writer, I am a blogger. 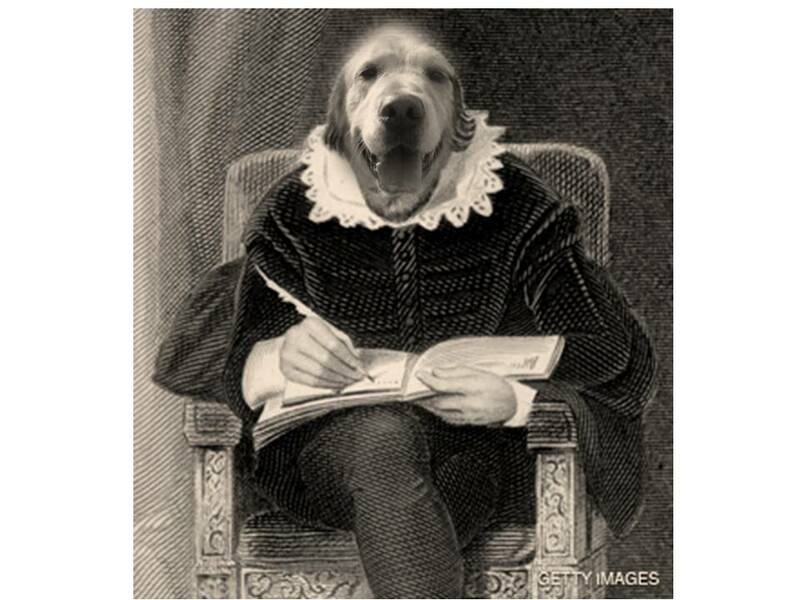 Maybe I can become the modern day canine Shakespeare. And my blog will turn into a great play and movie. I can just see my name in lights now. Written by ShakesBear. In honor of earth day I wanted to plant my very own tree. So we went out and got a tree to plant in my pooping area in my yard. I am so excited to have my own tree. I am responsible to fertilize it. And it is a flowering tree so I can pick flowers and give them to my mom on special days. She loves to get flowers. I will see how it goes with this tree and then maybe I can landscape my whole poop area. Azaleas would be nice since I am in the South now. We'll see. I finally went on a big neighborhood walk yesterday. Wow, it is long...all the way around a golf course. I saw a few pups in their yards, but I did not get to officially meet them. 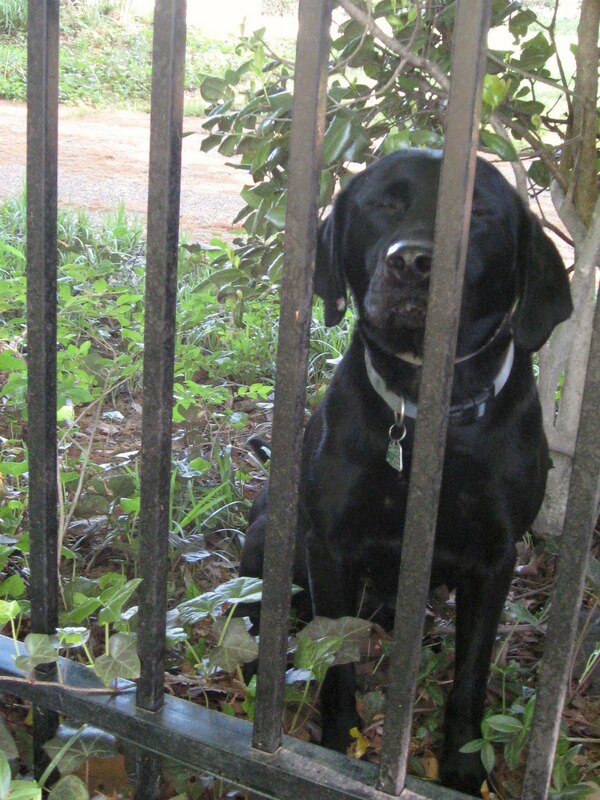 I sniffed my neighbor golden a bit through the fence. I can't wait to meet & play with him. The Springer barked up a storm, wasn't sure about me. The beagle wasn't very interested. The mixed guy also barked a lot. Mom told me I couldn't just run onto someone's property. I need to be introduced. So I will need to wait. Guess its not like the beach, where we just meet in the ocean. In my new home we have a piano. Mom always wanted one since she was a little girl so we have one now. Problem is that no one plays piano. Mom is going to take lessons. So I thought I should also take lessons. And since I am in Memphis now I can learn to play the Blues. Maybe one day I can perform at B.B. King's on Beale Street. Bear Bear King? Last week I went swimming in my new pool. It was really hot outside, so it felt so good to go into the cold water. I wasn't quite sure about the stairs at first since the ocean doesn't have any. But I got the hang of it pretty quick since I had to fetch my ball out of the pool. 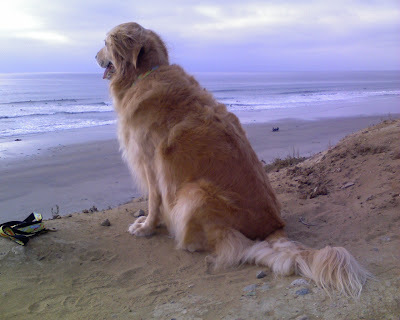 Big benefit over the ocean is not worrying about ear infections or tummy aches. I guess the vet bills will be less then. Maybe I could get more tennis balls with the money saved? Mom was right. There are so many squirrels in our yard. They always run away from me, so I gave up on having them as friends. So instead I chase them. It is so much fun. But it is also very frustrating. I can never catch them because they run up the big trees. I need to learn how to climb a tree. Who can show me how? Today on twitter my anipals are having a Carnie/Circus party. 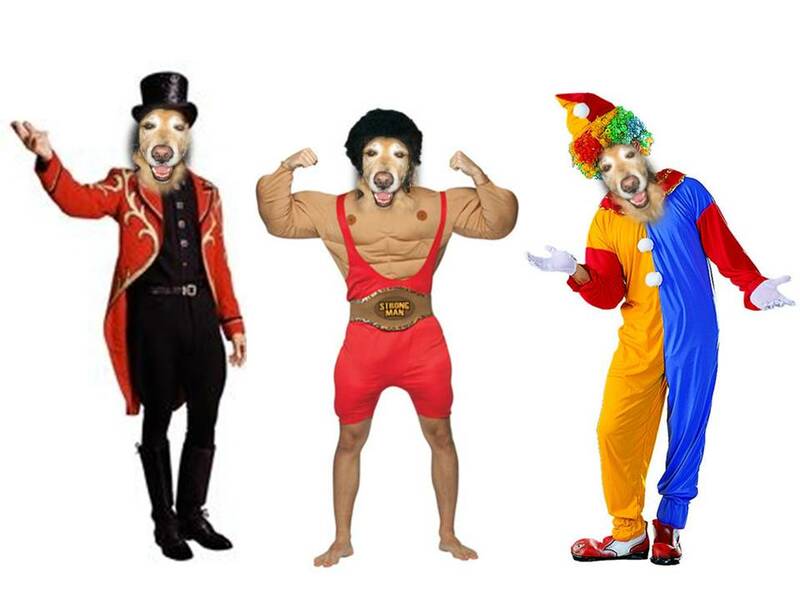 So while my mom & dad went out last night, I worked figuring out a costume. There were so many choices. I narrowed it down to three that I like but I just can't decide. Each represents some part of me. What do you think? The ringleader, the strongman or the clown? I really like my new home in Memphis. There are so many rooms to explore with very interesting smells. I think a dog may have lived here before. Not much smell of him in the house, but I found some pee mail outside that had not been forwarded. And there is lots of outside area for me to run and play. I feel like I have my own dog park. So I guess it will be nice when we do get another dog. The only problem is that Mom broke her toe, so she can't take me on walks to see the neighborhood. And Dad's foot has been hurting, so he's no help either. Well, I guess I need to wait to make my debut. So after just over 3 hours we landed in Memphis. I got off the the plane and heard fun music playing. My dad said that was to welcome us to Memphis. But there was no red carpet, so I guess I am not a celebrity in Memphis. At least not yet. So all in all, I thought it was a really fun trip. I don't know why Mom and Dad complain about air travel. I like being part of the jet set! I stepped from the red carpet up onto the stairs of the plane and boarded. I chose to sit on the floor in between my mom and dad. My mom held on to me and petted me while we were taking off. I guess she was scared. Then I settled in and laid down and took a nap. Then Daddy ate his lunch and mom gave me cookies. 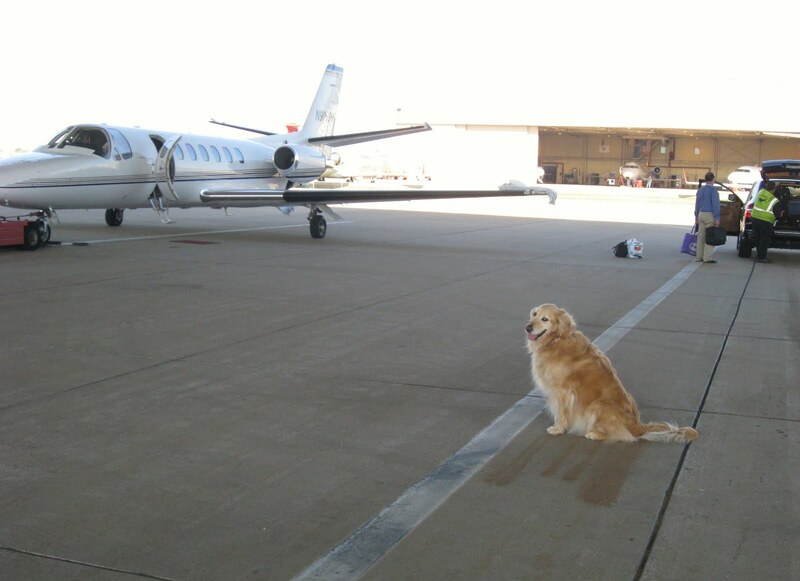 The pilot came over and pet me for awhile. Then we started descending and I watched straight out the front window. Very cool. So I think maybe now I want to become an airplane pilot, or maybe just a co-pilot. The van that picked us up from our house, took us to this small airport. We drove right up to this very small plane with a red carpet in front of the door. A red carpet! So I immediately started looking out for celebrities. I got out of the van and these people led my mom & dad and me to the red carpet! I thought wow! I, BearBear am a celebrity. Then my mom told me we were going to fly to Memphis on the plane all together. How cool is that! Maybe I really am a celebrity. Has this blog become that famous? Today is my niece BunnyBell's birthday.We don't know exactly how old she is because she was a rescue. She will probably be forever 4. Everyone always asks what kind of dog she is. My sis (her mom) based on the DNA test says she is a Crested Pompoo Powderpuff. I would just say, a Pomeranian mix. I used to get really annoyed by her. She kept copying everything I did including lifting her leg to pee wherever I did. She would get to be carried or sit on my mom's lap, neither of which I can do. But then I started spending more time with her when my mom kept borrowing her from my sis. And then I started liking her lots. 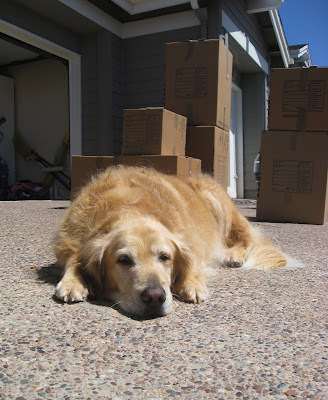 Now that I have moved, I wont see her much. That makes me sad. I know, I will ask my parents to celebrate her birthday with a pizza. Too bad she wont be here to have a slice. Today I am flying to Memphis. I have never been on a plane before. I have never even seen a plane other than on TV or when they fly overhead. So I am very curious about this experience. I don't understand them at all, like how come a plane can fly but not a car? 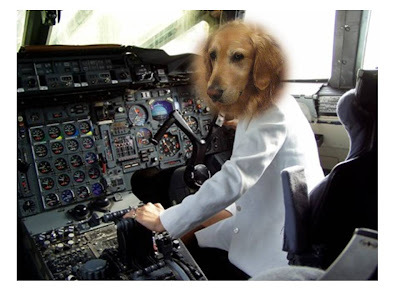 I hope the Captain of the plane will explain it to me. And do you think the Captain will let me try flying the plane? Tomorrow is the big day. I am moving from San Diego to Memphis. So yesterday I had to say good-bye to my beach. So many ask, are u going to miss it? Like DUH!. But I will have a pool, so I can still swim. My mom says I will love my new house and my new neighborhood, and I have always been able to believe her. 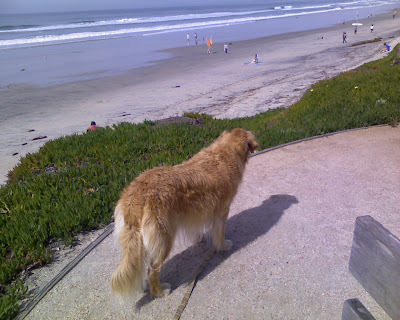 So good bye Del Mar beach. Thanks for the memories. Oh! The ocean waved back! I love my sister Sydne and BunnyBell so much. I don't get to see my sis that often since she lives a couple hours drive away. She pretty much comes every time her laundry fills up an army duffel bag. I get to see BunnyBell more, because she stays with us since my sis is so busy. Actually it is more like consensual dog napping by my mother. But now I am moving, and I will be over 3 hours away by plane. I will miss them so much. I hope they come to visit real soon. I guess my sis can check an extra suitcase with her laundry. Every morning, Mom takes me for a short walk do to my morning constitutional. We usually go to the end of the trail and she expects me to poop there. It is near the train tracks, with fencing and dirt...not a very pretty spot. 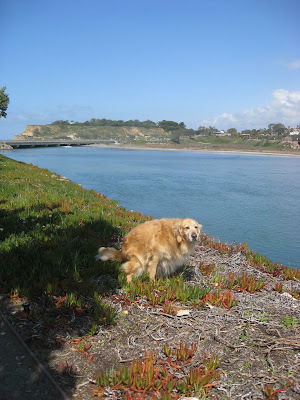 So today I thought, why should I poop there when there are so many lovely places to poop along the way with a view. So I picked a pretty spot and did my business. I wonder what kind of view I will have in my new neighborhood poop area. The other day I discovered that I am interested in squirrels. In this picture I am looking at a squirrel, not the beach. There were some girls below the bluff that got scared because they thought I was getting ready to attack them. Yeah right. Where we used to live I was more interested in the little bunnies that used to hop by. And I don't usually see squirrels at the beach. My mom said in our new house there will be lots of squirrels right in my front yard. That will be fun. 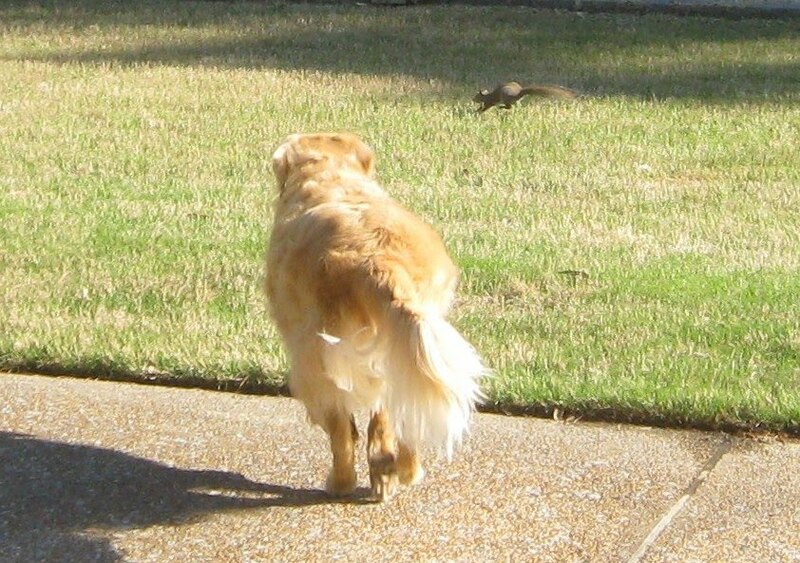 I will have new friends- squirrels. I hope they will want to be my friend too. Well it has been a month since my niece BunnyBell came to stay with us for her vacation. She left yesterday, so my life will go back to normal. I will be an only dog again. That means I will get all the attention. I can enjoy my treats without two eyes staring at me. My mom will go a lot faster on our walks. I will have more room in bed. I will not have to share my dog bed in the living room. And this blog will go back to being about me again. So I felt my first official earthquake. A 7.2 centered in Mexicali. I think I'm a little over 100 miles from there. I was upstairs with Mom who was trying on jeans in her closet to see which fit her. We heard this glass shaking and then the house rolling and then my sis called out from downstairs that it was an earthquake. So mom ran down the stairs with me but she forgot her pants. At least she was safe. But from now on, I think she should always keep an extra pair of pants near the door just in case we get another earthquake. 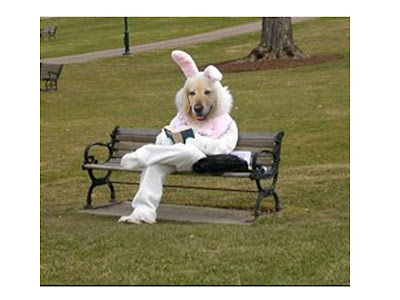 I have always wondered what it must be like to be the Easter Bunny. So I decided to read about it. Interesting history, has something to do with fertility. That doesn't have any relevance to me, since I had my operation. Anyway, the modern day Easter Bunny brings baskets of eggs and candies to children. I would like to do that. I love kids. But if I were the Easter Bunny, I would also bring baskets to my dog and kitty friends. Those baskets would be filled with eggs and bacon. Happy Easter! What is it about tennis balls that I can never get enough of? I personally only really like the yellow ones. I feel I need to have one wherever I am. Even just sitting next to me, knowing one is there makes me more comfortable. I can keep retrieving a tennis ball for as long as someone wants to throw it for me. I don't feel right swimming unless I am going to get or have a tennis ball in my mouth. The sound of a new tennis ball can flipping open makes me drool. I wonder if this is some type of medical condition. Obsessive Ballpulsive behavior? I went for a long beach walk the other day with my Mom. One part of the beach is bordered by these beautiful, but unstable cliffs (I wrote about them in my February 26th post). I decided to take my nap right next to them for shade. My mom went to find shells. All of a sudden I heard rumbling. I thought I was dreaming. I looked up and there was this giant boulder coming down. AGHH! I ran away just in the nick of time! Actually, that didn't happen. APRIL FOOLS! But this pic is real, so they truly are unstable cliffs, just as the sign says. And I will be careful now in choosing where I take my beach naps.